TAVISTOCK (NZ) (Bay 2005-Stud 2010). 6 wins-1 at 2, Waikato Draught Sprint, Gr.1. Champion Sire in Hong Kong in 2015-16. Sire of 180 rnrs, 111 wnrs, 15 SW, inc. Tarzino (Victoria Derby, Gr.1), Volkstok'n'barrell, Werther, Tavago, Tavidream - Circuit Glory (H.K. ), Hasselhoof, Hiflyer, Gobstopper, Pacorus, Infantry, Avisto, Longchamp, Nymph Monte, Tavy, Titanium, SP Salsamor, Harlow Gold, Downton Abbey, Fire Jet, etc. SPRING VENTURE, by Encosta de Lago. Unraced. This is her second foal. Her first foal is unraced. Attenborough. Winner at 2 in Aust. Ardeche (Dehere). 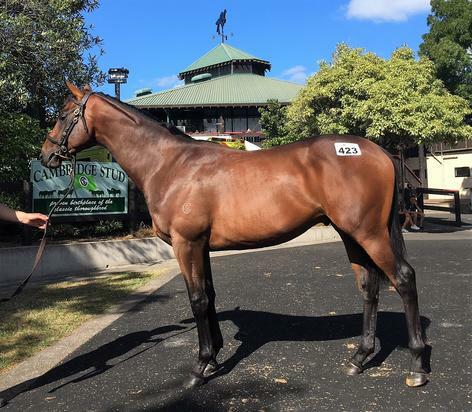 3 wins-1 at 2-at 1100m, 1200m, A$172,800, Scone RC Coolmore H., ATC Austbrokers ABS Bloodstock H., STC Members 2YO P., 3d BRC Lancaster S., L.
ASTORIA (Medaglia d'Oro). 2 wins-1 at 2-at 1100m, 1600m, A$322,550, to 2017-18, Newcastle JC Spring S., Gr.3, 2d ATC Schweppervescence H., Gr.3, 3d VRC Victoria Derby, Gr.1, ATC Ming Dynasty H., Gr.3. GIFT OF POWER (Power). 4 wins-3 at 2-to 1100m, NZ$123,275, to 2017-18, WRC Wakefield Challenge S., Gr.2, Wellesley S., L, 2d ARC Eclipse S., Gr.3.